The USA does not really have any exclusive places where you can go and find a Sonic the Hedgehog theme, every time you visit. However, there are events that change certain areas into Sonic-Areas for an amount of time. Often, these feature Costume Characters, so there is a bit of crossover. This is the type you can ride under, and it has a basket. This balloon toured Europe through various countries, but appeared in the USA as well. This is surprisingly detailed for a balloon, with distinct fingers and features. It is currently retired in a balloon preservation area in England. There is a pin with this image. A Float. This is from the Macys ThanksGiving Day parade. It appeared for a few years, until Sonic was given his new design. Seeing this float would make the parade route a "Sonic place"
This was made by Cameron Balloons in England, and the photos are by Pete Hughes and the preservation society. It was active in the 1990s to promote Sonic 3. Well. 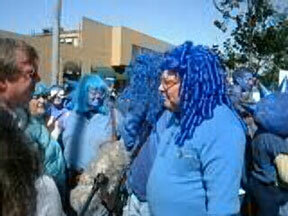 Sort of famous. And mostly a tour. 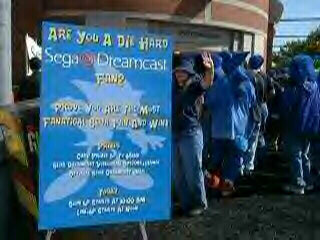 This was used to promote the Sega Dreamcast when it first came out. 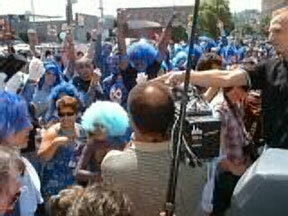 As far as known, this took place only in California. This sign announces the location of the 'party'. The message is a little off, as you can't really be a die-hard fan for something that you didn't really play yet that much. 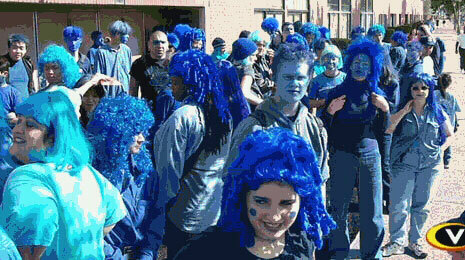 Tons of people tried to win, and some put forth more effort then others...How did Sonic ever have an afro? A nice big shot of the line of people waiting to be judged. What is that "V" logo in the corner? It is what used to be the logo for "gamespot". They've since changed their logo, but they're still around. Info submitted by Pira Jacinto. Random bald guy wandering through the place. The guy in the photo to the left did quite a good job. Look at his plush spikes and special pants! He even has white gloves and a power Ring. 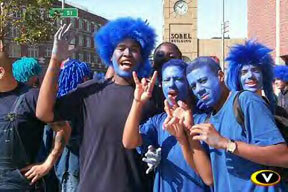 Is this curly man really a fan? 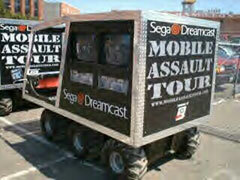 It wouldn't be a Mobile Assault Tour if you couldn't assault various towns with large vehicles. The improbable 6 wheeled golf cart like console-carying device and the truck that everything is packed in. There were several trucks made up like this for the tour. 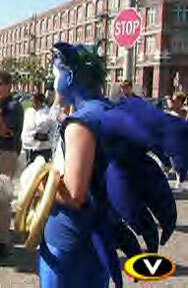 A Costume Character Sonic is here to encourage the fans, and give out the prizes. This one appears to be made out of lycra or something, with how shiny it is. For a while, Howard Johnson Hotels were a Sonic place. They did a promotion with Sega Game Gears, and gave away this sticker card if you stayed there. 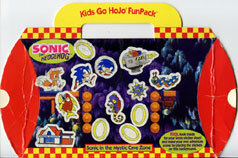 You can build a scene in the Mystic Cave of Sonic 2 (Genisis...not gamegear) with the stickers. Photos courtesy of MCRG. 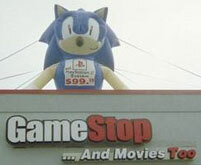 This GameStop in the USA is a bit of a Sonic place, with this giant Sonic wind-balloon on the roof! This is a giant sort of inflatable construct (much like those big gorrilla things usually found on used car lots...but why?) used to draw attention to the building. In this case, they've added a banner to him announcing that Playstation 2s are $99.99 (in 2004) Much like spring-sitting Sonic (also a wind-balloon) this one is just so-so. The eyes are small and a bit strange, and his face isn't 100% right, but it's still interesting to see! Photo by PPG-Katelyn. 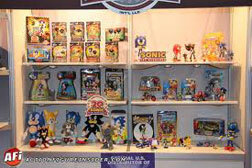 These are photos from the Sonic 15th Anniversary celebration that was held...somewhere. As you can see, the main attraction is this professionally made cake. The whole thing is nicely checkered, with some stars and blue spheres reminiscent of the special stage. It has the 'title screen' style winged ring, with the 15th Anniv logo on it, and the cake topper sits on a pedestal base. However, the topper is not made of cake. It is merely sculpted...and oddly too! 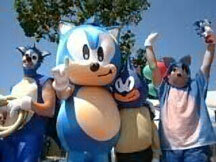 Look at the curiously off-model Sonic that they use. And it's not that they had to make him out of some unreliable material...he's got BANGS! It seems the cake decoraters weren't really paying that close of attention to him when they made it. However, the cake itself looks very festive and gives an over-all good appearance. 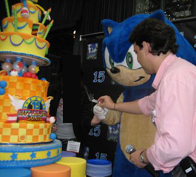 A mascot suit can be seen here helping to cut and serve it, and reports from the event were that the cake itself was actually quite good. This is a great and fancy cake to get to see! 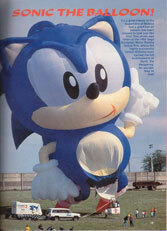 This is a photo from a magazine titled "Sonic the Balloon". Think it's the same hot air balloon as seen on the top of this page? Look again! That's right....this one only has 1 finger raised, while the top balloon has 2. What's going on here? They've got the same sort of poor "fan hand" thing going on with the other that has such a thumb problem. Is this the same balloon, but they altered the hand later? And if so, why? You can also see clearly on the basket "Sonic 2" with the logo. He's on the equipment truck as well. The little people in the photo give a good idea of how big this thing really is. (Giant!) What does the text say? 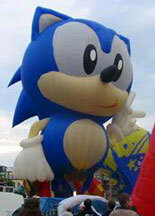 Basically how the balloon is a fitting tribute to the superhero of Mobius...and gives the details of where this is. "At the 1993 Sega Euro Motor Racing Grand Prix, where the highly successful Cannon Williams team had the full endorsement of Sonic--no wonder they're so fast".